석장승은 마을을 지키는 수호신으로 ‘당산’ 혹은 ‘벅수’라고도 한다. 순창 충신리 석장승은 거대한 사각의 자연석 한 면을 장승의 모습으로 다듬었다. 머리는 왼쪽으로 경사지도록 깎여 있고, 다른 장승과는 달리 눈이 작게 조각되어 있다. 세모난 콧날은 끝이 뭉툭하게 잘려져 있는데, 이는 장승의 코가 아들을 낳는데 효험이 있다는 민간신앙에 따라 아들 낳기를 원하는 마을 아낙들이 떼어간 것으로 보인다. 이마와 양 볼에 혹이 불거져 나왔는데, 이마에 새겨진 혹은 불상의 눈썹사이에 있는 백호(白毫)를 연상시킨다. 웃는 듯한 입 사이로 내민 혀의 모습이 소박하고 친근감을 느끼게 해준다. 보통 석장승에는 남장승과 여장승을 나타내는 이름이 새겨져 있는데, 충신리 장승에는 아무런 내용이 없다. 충신리 석장승은 애교스런 생김새와는 달리 남장승으로 전하고 있다. 조선시대에 세워진 것으로 보이는 이 장승은 마을을 수호하고 부정한 것을 막기 위한 주민들의 염원이 깃들어 있는 민속신앙 중 한나라 할 수 있다. ※ 순창군 충신리 대로변에 있던 석장승은 2004.12월 순창-남원간 도로변의 순창문화회관 뒤뜰에 순창 남계리 석장승(국가민속문화재 제102호)과 함께 옮겨졌다. Erected in the middle of a rice paddy, on the right side of a wide road in Chungsin-ri, 500 meters north from Sunchang-eup toward Jeonju, this stone guardian post is perceived as a deity guarding a village and was called “dangsan” or “beoksu.” It was made of a single unprocessed stone with height reaching 180 cm; only one side of the stone was carved to make a guardian post. Its head was carved to be tilting sideways to the left. Unlike other guardian posts in this area, it has very small eyes. A big chunk of its triangular nose is missing, probably taken by village women who were eager to have a son based on the folk belief that the nose of a guardian post would help them conceive a son. It has lumps carved on both cheeks and on its forehead, reminding one of the white spot on the forehead of a Buddha statue. The tongue sticking out through a vaguely smiling mouth makes it appear friendly and rustic. 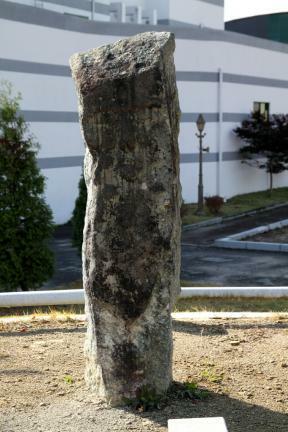 Unlike most of the guardian posts with names inscribed on their bodies to indicate their gender, this particular pole in Chungsin-ri has none. In the end, this pole has been regarded as a male pole among the villagers. A rite for the guardian post had been dedicated annually before the first full moon of lunar January after holding a dangsan rite but was regrettably discontinued. 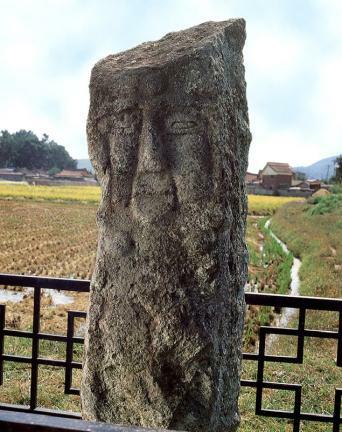 Judging from the fact that there is another stone guardian post remaining on a road from Sunchang-eup toward Namwon-si in the east direction, guardian posts had probably been erected at all entrances in each direction to the village. This guardian post, which seems to have been made during the Joseon Dynasty, is a good example of folk beliefs. 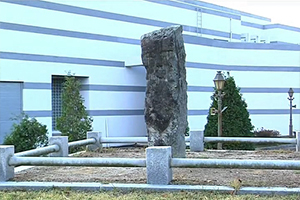 ※ In December 2004, the stone guardian post, together with the one (Important Folklore Material No. 102) in Namgye-ri, was moved to the backyard of the Sunchang Cultural Center located on the roadside between Sunchang and Namwon.